Relax and play in paradise. Welcome to our exclusive condo at Windward Pointe. Wake up to the peaceful sounds of the crushing Gulf waves. Become mesmerized by the beautiful sunrise from our East corner unit and enjoy panoramic views of the Gulf of Mexico’s clear blue waters. 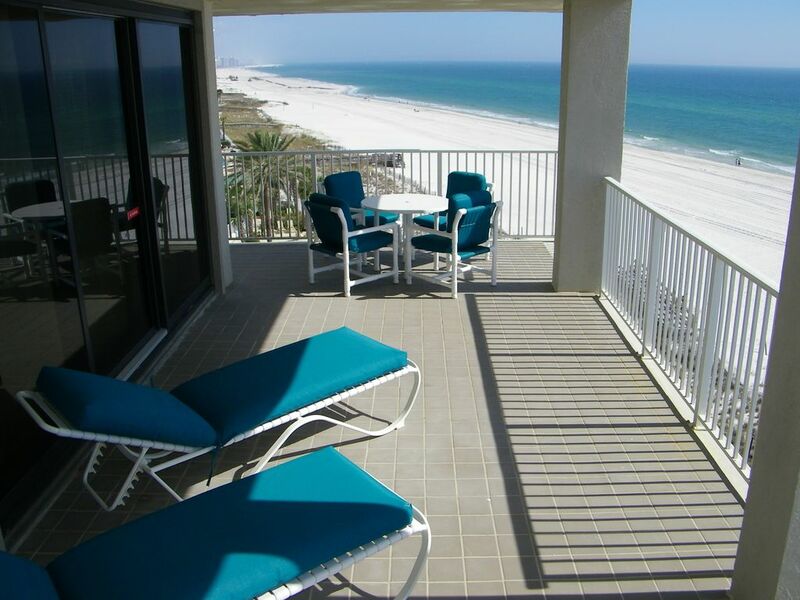 Directly located on the sugary white sands of Orange Beach, our condo provides the amenities that will meet all your vacation needs. Comfortably sleeping up to 8 guests, our 3 bedroom and 2 bathroom condo has a King, Queen, and two Twin size beds. The living room sofa converts into a cushy queen-size sleeper. Accessible from any bedroom and the living room, lounge around or dine on our 90 ft wrap around balcony. Located on the sixth floor, the condo is steps away from the elevators and stairway, saving you plenty of time for fun activities. Watch a movie or catch your favorite cable TV show from any of our bedrooms and living room. Each bedroom has a smart TV so you can stream movies, shows or internet radio. Use our Wi-Fi to access our wireless internet from every room in the condo. Entertain guests with our fully-equipped island kitchen with stainless steel appliances and enjoy your favorite songs with our surround sound system, available throughout the entire unit, including the balcony. Whether you are planning a romantic get-away or a family vacation, there is something for everyone. We look forward to accommodating you and your guest at our little piece of paradise. Each bedroom has a smart TV so you can stream movies, shows or internet radio. DVD Player is available in the Living Room. The bedrooms have smart TVs so you can download movies, shows & listen to internet radio. Connect to these TVs with your laptop using an HDMI cable. Relax on the beach with convenient beach chair and umbrella rentals located in front of the complex or take a dip in the indoor or outdoor pools. The complex also includes a fitness room, tennis and basketball courts. After an intense workout, take a break in the hot tub or sauna. This is our second time staying at this condo and it’s perfect for our family. Very clean, pretty and has everything you need. Breathtaking view !! The condo was bigger than I expected which was a plus. Everything was clean and well kept. My family enjoyed the speakers throughout condo including outside on the huge deck. The deck alone sells itself. We will definitely be back. The condo is well maintained and well equipped. Beautiful furniture and accessories. We really enjoyed our stay. It is very well situated, has a beautiful 180 degree sea view. We loved the pool and easy access to the beach. Dolphin Tours, Sailing Adventures, Snorkeling, Parasailing, Jet Ski/Wave Runner Rentals, and Charter Boat Fishing are all available within minutes. If you are planning a golf getaway, there are 10 golf courses within 20 minutes. Across the street is the Alabama Gulf State Park, featuring numerous bike and hiking trails. The Park also includes the longest fishing pier in the Gulf of Mexico. There is plenty of shopping at the Wharf, only 4 miles away, or the Tanger Outlet Mall in Foley, 13 miles away. Catch a movie at Rave Motions Pictures, only 3 miles away, or Cobb Pinnacle 14 Cinemas, 8 miles away. Enjoy family fun at The Track with Miniature Golf, Go Karts, Bumper Rides and Thrill Rides, 8 miles away. And visit the famous FloraBama restaurant less than 5 miles away. Take an adventure in the sky on the Hot Air Balloon and Open Cockpit Airplane Tours. Learn of the colorful history and view the hurricane exhibits at the Gulf Shores Museum. Admire the area’s finest artists and craftsmen at the Orange Beach Art Center. Windward Pointe Unit 601 24770 Perdido Beach Boulevard Orange Beach, Alabama 36561 •	CHECK-IN TIME IS AFTER 3:00 P.M. AND CHECK-OUT TIME IS 10:00 A.M. (CST). NO EARLY CHEK-IN OR LATE CHECK-OUT •	This is a NON SMOKING unit. •	Pets are NOT permitted in rental units under any conditions •	We will not rent to vacationing students or singles under 25 years of age unless accompanied by an adult guardian or parent •	DAMAGE POLICY - A property damage protection coverage of $89.00 is required. This must be received the day of booking the reservation. PAYMENT- The full amount of the rental fee must be paid in advance 14 days before your arrival date CANCELLATIONS- a 2 week notice is required for cancellations. PARKING PASSES: Renters must display parking pass on the front dashboard at all times NO DAILY MAID SERVICE: While linens and bath towels are included with the Unit, daily maid service is not included in the rental rate. We suggest you bring beach towels. Do not remove linens or furnishings from the Unit. A starter set of soap and toilet tissue is provided for your convenience. KEYS: A service fee for $45.00 will be charged if you lose or lock your keys in the Unit requiring a service call. If it becomes necessary to call a locksmith, you will be liable for the service call. OCCUPANCY: The number of persons occupying the Unit is limited to the actual sleeping capacity shown or the number of register guests, whichever is smaller. PROVIDING A FAMILY ENVIRONMENT: We are very serious about maintaining a family atmosphere for the quiet enjoyment of our guests. We will rent to family groups and responsible adults. No sororities, fraternities, school or civic groups will be allowed. Absolutely NO HOUSE PARTIES ALLOWED. Violations are grounds for eviction and forfeiture of monies paid. GENERAL: Please abide by the rules and regulations of the owner and Condo Association. Follow all posted rules concerning the use of the pool and other amenities.